Human capital can be described as the knowledge, skills, and experience possessed by a group of individuals. Mobilizing people in ways that produce shared benefits is a key to creating vibrant communities. OSU Extension helps community residents gain the knowledge and skills they need to engage in meaningful dialogue focused on positive change and collective impact that meets local needs. More than 635 youth in Stark County completed quality assurance training on good production practices and ethical care for their 4-H animal projects. Hamilton County’s role in media outreach touches a diverse market share through iHeart Radio. Weekly horticulture-themed educational series are aired by 34 radio stations in 12 states. OSU Extension shared research-based resources to improve health and wellness to more than 2,050 visitors at 10 community health fairs in Montgomery County. 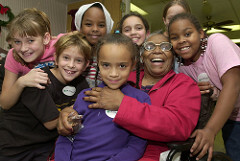 Lucas County Extension utilizes 269 trained volunteers to strengthen and extend its work. Volunteers include 4-H, Master Gardeners, and Ohio Certified Volunteer Naturalists. In addition to the more than 5,000 hours of training and continuing education required to remain active, this group gave in excess of 18,000 hours with a value of $424,080 (Independent Sector, 2015). Mahoning County Extension trained 30 residents on pollinator awareness and 33 residents in first-detector diagnostics. These participants gained new knowledge in ways to promote and protect pollinators and how to diagnose plant issues and diseases. Through OSU Extension education and leadership, 1,071 Master Gardener Volunteers in 9 of Ohio’s most populated counties volunteered more than 65,000 hours of service to their communities. Around the state OSU Extension has developed successful partnerships with Metroparks to offer programming such as Youth Outdoors in Cleveland and Adventure Central in Dayton. The 2016 NACDEP Excellence in Community Development Work award recognized Joe Lucente as Individual Runner-Up for his work with Ohio Lake Erie's Marina Business Industry Retention and Expansion Program. NACDEP Distinguished Career Award recognizes a NACDEP member who is actively engaged in Extension community development programs and who has served more than seven years in Extension community development programming. The 2015 winner was Nancy Bowen. NACDEP Innovation and Creativity Awards recognizes members who have developed an outstanding effort or program that integrated innovation and creativity in effective community development program design and implementation. In 2015, Cynthia Lei was Individual Runner-up for her Economic Impact Analysis. In 2015, Julie Fox was awarded the Diversity/Multicultural Award, North Central Region, from the Epsilon Sigma Phi Extension Fraternity. This OSU Extension in the City work group is led by Myra Moss.